Li Rongbiao, a 67 year old pensioner and inventer, is making headlines in China because of his handmade electric chairs. Also known as the Walking Chair, it is assembled from spare parts and consists of spare wheels that ease stairway access for wheelchairs. 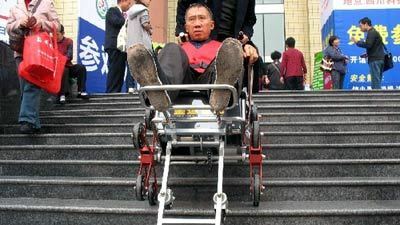 Rongbiao started playing around with the idea of an affordable electric wheelchair when his wife ended up with a broken leg. It so happened that in this period, they faced a number of hassles, including difficulty accessing their fifth floor apartment. That’s how this self-made inventer found himself buying computer books and looking for financing for his project. However, the building of the chair took a bit of time since Rongbiao first had to handle all the basics. Thus, he taught himself computer designing for 6 months before spending the rest of the year constructing his dream chair. As for funding, the innovator was so dedicated to this dream that he pooled all of his income into this project. This included his savings, pension money as well as odd $70,000 he made from the sale of his apartment. All this effort is not in vain as his Walking Chair is gaining popularity in China. In fact, after he demonstrated his invention at one of the biggest disability shows in China, he has been receiving orders for the electric chair. And so, following his visit to this expo, interested parties have bought 30 of his Walking Chairs and there is still a backlog of more than 300 orders. I think I will pass on this chair.